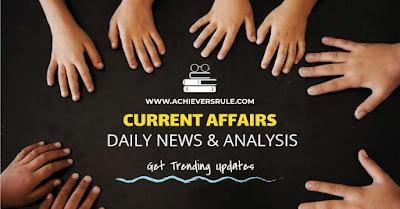 In our today's Current Affairs Updates for 26th May 2018 we have brought to you some of the Latest News Headlines such as Lt Gen Devraj Anbu is the new Vice Chief of Army Staff, Justice Chandramauli Kumar Prasad Appointed As Next Chairman of PCI and others.Each of the news have been placed under the most relevant category so that it becomes easy to go through them topic wise. Based on these we are going to come up with One Liner Static GK and Daily Current Affairs Quiz very soon. Aspirants should go through these in details as they are very important for the upcoming government examinations like IBPS PO, IBPS CLERK, SSC CGL and SSC CHSL. In his new role, Biswas will be responsible for driving Airtel Payments Bank's mission of taking convenient and innovative digital banking services to the doorstep of every Indian, the statement said. Charan Singh, the RBI chair professor at the Indian Institute of Management, Bangalore, has been appointed as the non-executive chairman of Punjab & Sind Bank, Financial Services Secretary Rajiv Kumar tweeted. Anjali Bansal, the former managing director of TPG Private Equity, has been appointed at Dena Bank, while Tapan Ray, the former corporate affairs secretary, will take charge at Central Bank of India. The three appointees will be part-time non-official directors on the boards of the three public sector banks. Former apex court judge Justice Chandramauli Kumar Prasad was appointed on 24th November as the next chairperson of the Press Council of India (PCI). The Common Services Centre SPV (CSC SPV) and Small Industries Development Bank of India (SIDBI) has signed a pact for providing financial support to Village Level Entrepreneurs (VLEs) across CSCs. HDFC Bank launched its Digital Loans against Mutual Funds (LAMF), in partnership with transfer agent CAMS. Digital Loans against Mutual Funds is available for resident Indians and for portfolios that have individual holdings. Mumbai Banks' credit grew by 12.64 per cent year-on-year to Rs 85,51,099 crore in the fortnight ended May 11, 2018, according to an RBI data. Banks' deposits grew by 7.61 per cent to Rs 1,13,92,165 crore in the fortnight ended May 11, 2018, compared with Rs 1,05,86,083 crore in the fortnight ended May 12, 2017, the data by Reserve Bank of India (RBI) showed. The Union Cabinet approved an ordinance to set up the country's first national sports university in Manipur. Union Law Minister Ravi Shankar Prasad said a bill to set up the university in Imphal (west) is already pending in parliament. The proposal to set up the national sports university in Manipur was initially announced by Prime Minister Narendra Modi, while Rs. 100 crore funds for it were allocated in the 2014-15 budget. Praising the efforts of CSCs in improving women's health and hygiene through Stree Swabhiman initiative, he said that, CSCs are doing outstanding work by providing low-cost sanitary napkins to girls and women in rural India. Prime Minister Modi laid emphasis on cooperation in the fields of agriculture and food security, saying that such cooperation is important in realizing the aim of doubling farmers incomes. Both leaders acknowledged the private sector's role in boosting trade and investment. PM Modi assured investors from the Netherlands that government of India is committed to economic reforms. The Governments of India and The Netherlands will announce the launch of the first-of-its-kind collaborative research programme on HIV/AIDS, between India, The Netherlands and Sweden. Pakistan is hosting a three-day Shanghai Cooperation Organisation-Regional Anti-Terrorist Structure (SCO-RATS) meeting in Islamabad from today – its first ever since the country became a member of SCO in June last year. The Film Festival will be a platform for people of the film industry of member countries to explore areas of cooperation in the domain of cinema and cultural cooperation. It was a revival of old memories for Tejaswini as she had won the World Championship gold in prone in 2010 in Munich. She had recently won gold in the Commonwealth Games in Gold Coast. IIT Bombay has won the Clarivate Analytics India Innovation Award 2018 in the Academic Institutions category. The award places IIT Bombay in the top 12 innovators in India. Singchung Bugun Village Community Reserve Management Committee (SBVCR) of Arunachal Pradesh was awarded the India Biodiversity Award, 2018, on Tuesday, on the occasion of the International Day for Biological Diversity, at Professor Jayashankar Telangana State Agricultural University in Hyderabad.